Old Tudor was a very macho dog and he played that role to perfection. He'd hunt the cat, he'd bite the vet, he'd scare the postman witless - Tudor would do everything right and not only that, but he would do it right the way it should be done right. Every single time. However. Every once in a while he would get things wrong and act the total prat. One of these occasions was his up-side-down trick. Five or six times in his life, Tudor took the quite deliberate decision to act strange. He would get up suddenly and mill about for a little while, making sure that everyone was watching. After the first few performances Meg or I would thump the other painfully in the side - this was not to be missed. Tudor usually walked into the next convenient corner, looked around to make sure that we were riveted, and placed the top of his head firmly onto the carpet. This in itself is a strange and wonderful sight, but for some reason he now started to kick his hind legs with great force, until he managed to achieve takeoff velocity and for about five seconds he would be stuck in that corner, head on the floor, hind legs high in the air and a look in his face so old fashioned, it could have produced amber. 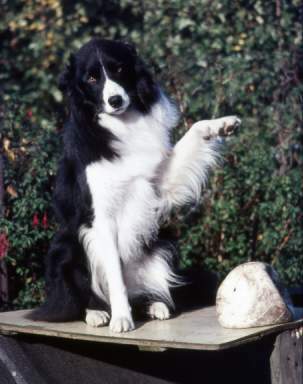 The moment of suspense lasted only a short time, because a dog's anatomy has not evolved for prolonged head-standing. Tudor would fix us firmly in his sight and proceed to slide slowly down the wall towards a more convenient centre of gravity - that prehistoric look never leaving his jowls until he lay flat on his back on the floor. Now he would scramble up, ignore the applause and slink away. What evolutionary pressures forced him to give this performance I do not know, but it's the most remarkable example of an animal acting the prat I have ever seen.